Stainless steel wire rope thimbles for forming reinforced eyes in wire ropes. 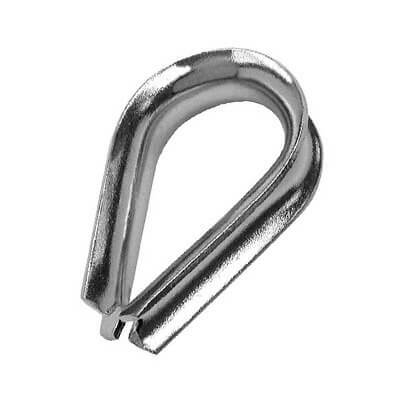 Always match your thimble to the same size wire rope, eg: 2mm thimble = 2mm wire rope. 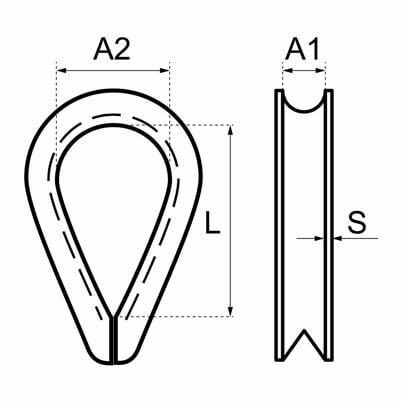 Thimbles reinforce loop eyes in stainless steel wire rope, this will provide a longer lasting wear surface and help to support the wire rope eye. All items were wholly satisfactory. Does what it says on the tin. Simple application. Matching size for use with the purchased stainless steel wire rope to make a perfect 'hard eye' when used with the matching copper ferrules. Superb Thimbles, well made and fit perfectly to the stainless steel wire purchased! Good product and does the job. Great products! As specified and as required! Didn't use too tight bend for the cable that I purchased. My fault. Excellent quality, just what I needed. Very useful for a good cable eye. A well made stainless steel thimble for stainless steel rope. Unfortunately there are quite a lot burr on the edges. Excellent results can be achieved using these. Did exactly the job I bought it for.